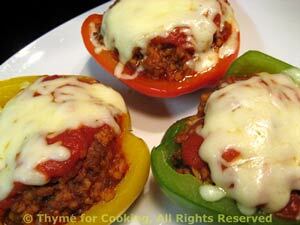 Stuffed Peppers, Italian Style, Thyme for Cooking gourmet recipes. Parboiling the peppers speeds up the baking time, allowing this dish to go together quickly. Use any color bell pepper that appeals to you. When buying, look for 4-sided peppers, they'll lay in the dish better and hold more stuffing. I used the half red from Monday, the half green from Sunday and 1 yellow. I originally did this with a tiny pasta called Frog's Eyes (Acini di'Pepe), but I can't get it here so have substituted couscous. You can use the pasta if you have it or even Vermicelli, but it will take a few minutes longer in the skillet. In nonstick skillet heat oil over medium-high heat. Add paprika, fennel and chili powder and sauté 1 minute. Add beef and sauté until cooked through breaking it up as it cooks. Drain tomatoes, reserving 2 tbs of juice. Chop and add to pan. Add reserved 2 tbs tomato juice, herbs, couscous and 1/3 cup red wine to skillet. Stir well. Turn heat to low, cover and simmer until couscous is done, about 5 minutes, stirring frequently and adding more wine if necessary. When ready spoon mixture into the pepper halves. Cover with foil and bake for 15 minutes at 400F (200C). Remove foil and top with cheese. Bake, uncovered for another 5 minutes. Remove from oven and serve.